Fisher Honda stands out in the Denver, Colorado area for its service, honest treatment, and competitive pricing! Whether you’re looking for a sleek sports car, reliable four-door sedan, efficient hybrid, the minivan that fits your whole family, the powerful SUV that braves the fiercest mountain weather, or the truck that gives you the freedom to haul whatever you need, wherever you want, Fisher Honda in Boulder, CO has just the right vehicle for you! Our philosophy at Fisher Honda is simple. If we treat our customers honestly and with respect, while providing the best vehicles at competitive prices, we will be successful. As one of several Honda Dealers in the Denver metro area, we understand that we have to work hard to earn and keep your business. 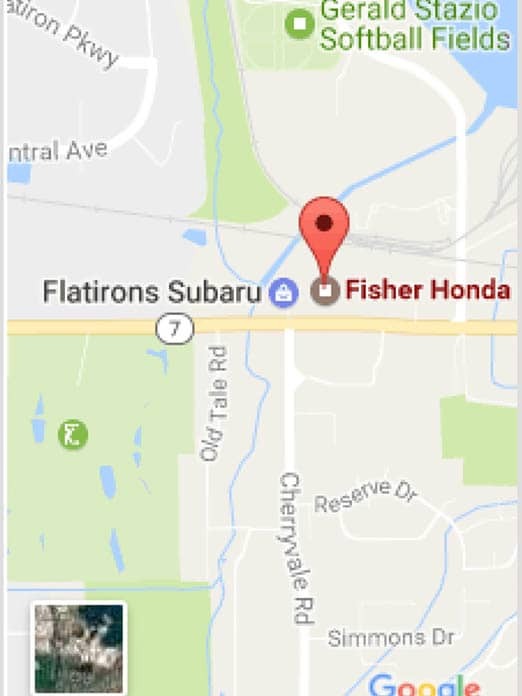 Located at 6025 Arapahoe Avenue in Boulder, Fisher Honda is your source for new, pre-owned and certified used Honda vehicles. Our goal is to give as many Colorado customers an outstanding dealership experience when it comes to price, selection, and customer service. It is through treating people right that Fisher Honda separates itself from other Honda dealerships in Colorado. Our dealership has proudly served Boulder since 1968 and we feel honored to support the community in everything we do. We are also one of many dealers in the Boulder and Denver areas you have to choose from. We hope to earn your business by providing the best-in-class service from the start of the sale throughout the life of your vehicle. Choosing from the seemingly countless car brands and models with different features and varying price ranges can make buying a new vehicle a tiresome process. But at Fisher Honda, we believe buying a new car should be one of the most exciting purchases you make. Buying your Honda from the Fisher Honda car dealership in Boulder will be an easy and refreshing experience, thanks to our highly qualified sales staff. With over 50 years collective experience, our sales representatives are committed to offering the best in service and our inventory of affordable used and new cars, trucks, minivans, and SUVs ensures that your Fisher Honda purchase experience will be above and beyond anything another dealership can offer. Whether you’re shopping for a new car, looking for parts and accessories, or need to have your vehicle in for service, you’ll find what you need at Fisher Honda. Our full line of vehicles are available for you to look at and test drive. Feel free to contact our customer-oriented staff with any questions or concerns about our new or certified used cars in our inventory. Also, check for any incentives or specials we may be currently offering. Quality Care is the difference between buying the car you love and loving the car you bought. It is the commitment of Fisher Honda is to provide you with the highest level of service and support possible. In fact, Quality Care is one of the greatest advantages of owning a Fisher Honda vehicle. Our service department is committed to your complete satisfaction.